Seasonal jobs are available in the summer and at the holidays, but what about during tax season? As an employee in the tax preparation industry, you can have flexibility and extra cash. Cindy Klein, H&R Block’s Premium Director, said there are several types of jobs available at local franchises around the country each tax season. The most common is tax preparer and classes to learn this job usually start in August or September. The class schedules vary in location and can be two or three days per week depending on the month. Students earn a certificate upon completion. Employees who complete the H&R Block course do not have to retake the course when they PCS and seek jobs with the company in their new location. Normally the course costs up to $295, but military installations are provided with free coupons for spouses. You can also contact H&R Block for coupons too. Klein said the course usually ends before Thanksgiving, but don’t despair if you’ve missed it. “Some people who have some tax knowledge can go online through H&R Block and test out of the classes,” she said. Another great way to cash in on a tax season job is to be the face of the franchise. H&R Block hires for their client services professional – the person who manages the front desk, greets customers and who Klein calls the most valuable person in the office. So what does the work schedule look like for a tax preparer as the public grows more anxious to finalize those forms? Around the first week of December, all employees go through a paid, week-long training tailored to their role in the franchise. Employees learn the ropes of the office, meet their co-workers and move into their workspace. Tax preparers new to the business are never given the intricate returns to process. “The first years usually receive the less complicated returns first and have plenty of opportunities to observe. We will not put them in a position to do the complicated stuff, as we want their confidence to grow,” Klein said. After your first tax season is complete, H&R Block provides a secondary continuing education program. For just twenty dollars per year, you can take as many hours of knowledge and skill building classes as you want. “There are hundreds of courses to take, both online and instructor led. It’s a huge opportunity to build on your basic understanding and you can choose different topics to learn about.” Klein said. Employees can take intermediate and advanced courses and receive a certificate for each one completed. There are pay boosts as well for employees who advance their studies, though a first year tax prepare is paid at an hourly rate, to take the pressure off, Klein said. Employees who return for a second tax season and beyond are in charge of their own income and are expected to network to bring in customers. These employees earn a commission for each return. “It’s not just sitting at a desk and getting paid anymore, we expect interest and enthusiasm,” Klein said. Employees can best network by earning the trust of repeat customers from year to year. H&R Block also provides employees with business cards as well as flyers that can be customized by the company’s marketing department. “We have preparers who do 20 returns and we have them who do 500 returns, and their paychecks reflect that,” Klein said. Doing well with your clients, building your business and taking advantage of the marketing resources can really pay off. “This can be a fairly profitable experience for three to four months if you want it to be,” she said. 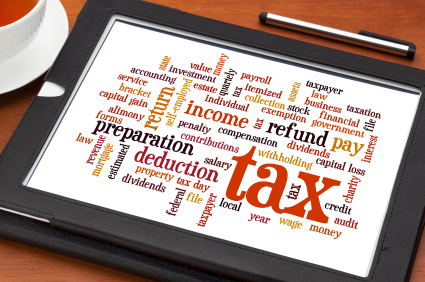 Read more to learn about tax preparation from the professionals at H&R Block.